Complex machined components and sub assemblies for a number of diverse industries. The latest CNC Mill-Turn technology from Mazak, enabling us to produce our products to the highest quality. CNC lathes from Mazak, with turning size capacity of up to 10” diameter. Wilson Manufacturing Limited based in Ringwood, Hampshire provides a first class service in the field of precision engineering. Supplying complex machined components and sub assemblies to a wide range of industries including, Aerospace, Oil/Gas, Defence, Marine, Automotive and Medical. 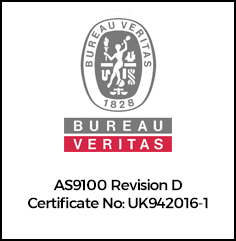 Our quality systems have been accredited to ISO9001:2015 and AS9100 Rev D (EN9100:2016). Whether it is development work or large production batches Wilson manufacturing offer an expanse of technical abilities and experience covering a wide range of industry sectors using both common and exotic materials. At Wilson Manufacturing we pride ourselves on working with and for our customers. Ensuring 100 % customer satisfaction is our number one priority. We offer a one- stop -shop for our customers managing projects working with our approved supply chain to offer the full service of design, project management, machining, fabrication, treatments and assembly. We have a highly skilled, flexible workforce that is able to operate to maximize the utilisation of resources. Because we work in an ever-changing industry the management and employees are regularly working with tooling suppliers and manufacturers to ensure we have the most up to date equipment so we can continue to meet our targets of 100 % Quality and 100% on time delivery, at a very competitive price. As well as Manufacturing we also offer a full Quality consultancy service.